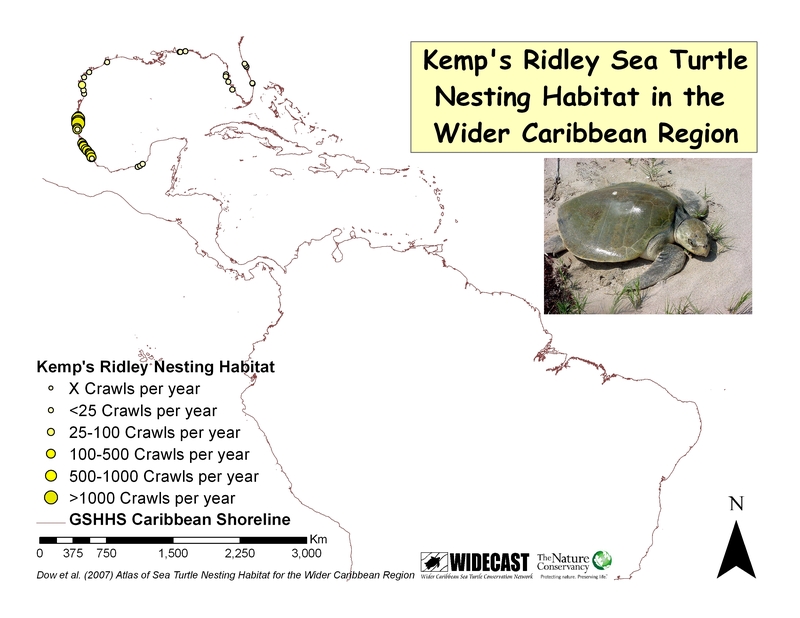 Why is it important to know where turtles nest? 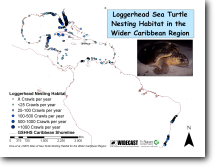 The answer is deceptively simple: to inform conservationists, policy makers and coastal developers, and to encourage countries to work together to safeguard important habitat and protect these ancient creatures. 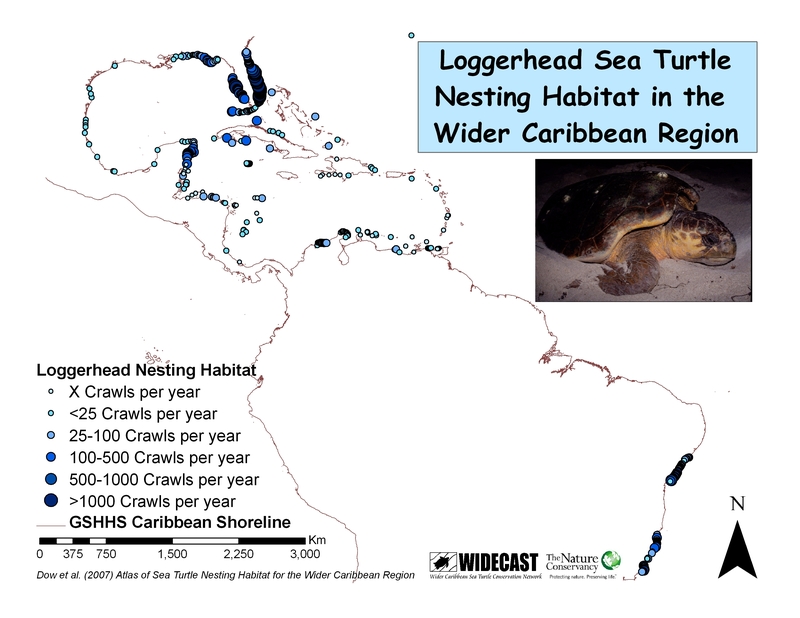 In a remarkable collaboration involving 120 Data Providers and other experts in more than 40 countries, WIDECAST, in partnership with The Nature Conservancy, has identified all known sea turtle nesting sites in the Wider Caribbean Region (WCR), including Bermuda and Brazil. 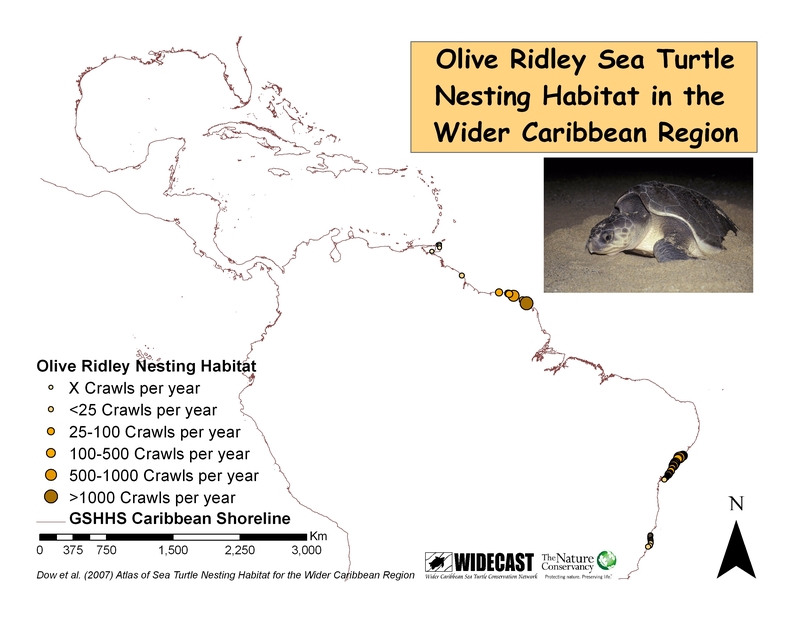 The resulting digital landscape significantly expands scientists’ understanding of habitat use and facilitates the creation of operational frameworks to gauge populations, monitor species recovery, and safeguard habitat in ways that have never been possible. 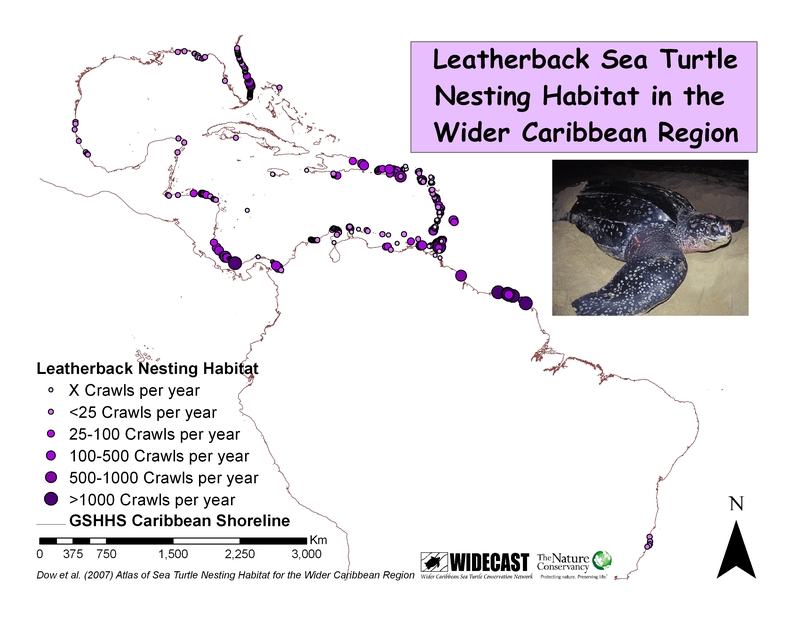 The landmark database identifies 1,311 nesting beaches, but because some sites host nesting by multiple species, 2,535 species-specific sites are named. 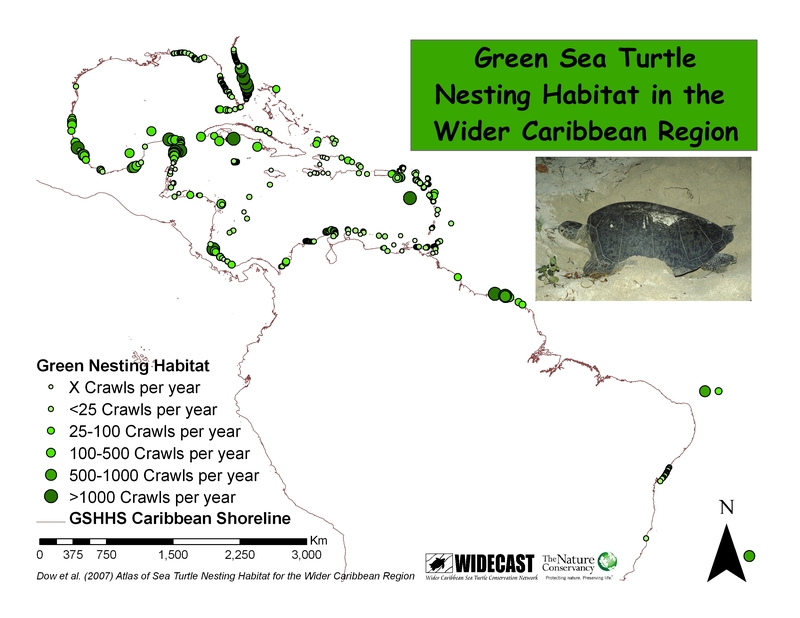 Of these, 77% are categorized in terms of abundance: Less than 25, 25-100, 100-500, 500-1,000, or >1,000 nesting crawls per year. 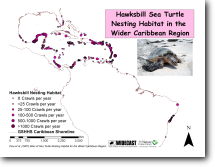 Hawksbill and green turtles are the least known, with 33% and 24%, respectively, of all known nesting sites associated with unknown crawl abundances. 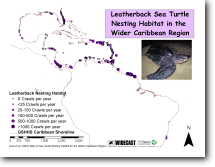 The atlas confirms that large nesting colonies are rare. 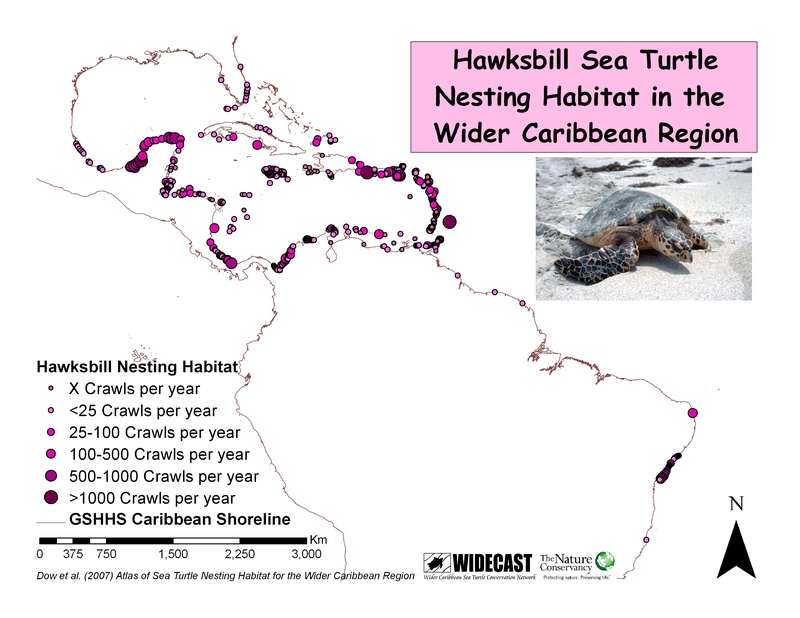 Nesting grounds receiving more than 1,000 crawls per year range from 0.4% (hawksbill) to 7.0% (Kemp’s ridley) of all known species-specific sites. 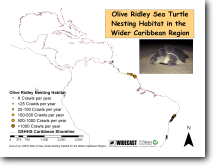 For any species, roughly half of all known nesting sites support fewer than 25 crawls (fewer than 10 reproductively active females) per year. 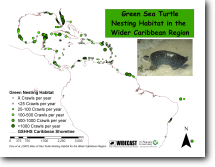 Threat matrices characterizing a range of risk factors, including those that result in the loss or degradation of critical habitat, reveal that beach erosion, nest loss to predators or physical factors, artificial beachfront lighting, direct exploitation of turtles and eggs, and pollution threaten the survival of sea turtles at their nesting grounds in more than 75% of all WCR nations and territories. 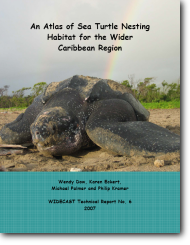 With regard to factors potentially hindering population recovery at foraging grounds, more than 75% of Caribbean nations and territories cite pollution, fisheries bycatch, entanglement, coral reef and/or seagrass degradation, and losses to hunters, poachers and natural predators as threatening the survival of sea turtles at sea. 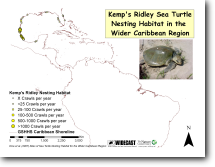 The successfully met objectives of the two-year mapping project were to generate the first standardized spatial database of active sea turtle nesting beaches in the central western Atlantic Ocean, to inform decision-making regarding the protection of critical habitat, to contribute essential species and habitat data to the eco-regional planning processes of international organizations and intergovernmental entities, and to promote implementation of regional treaties and other agreements that protect sea turtles and the habitats upon which they depend. 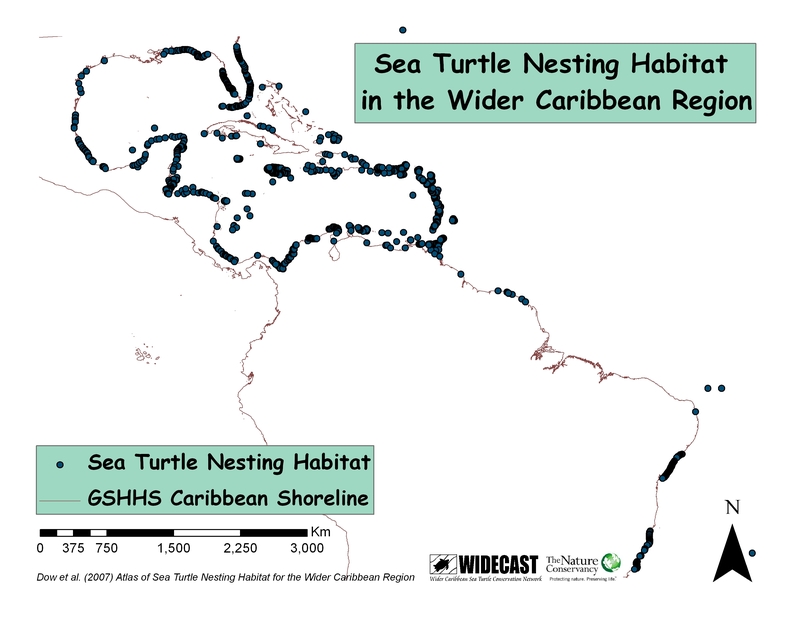 The database, archived and displayed online by OBIS-SEAMAP, will allow for further research and analysis of sea turtle abundance (including population trends at index sites) and habitat use; for example, in conjunction with other datasets to determine areas of high biodiversity or areas in need of urgent protection. Future goals of the project are to research and incorporate seagrass and coral reef data to determine nationally and regionally significant foraging areas, thus identifying marine areas in need of management attention and contributing to the development of a network of population monitoring programs, including juvenile and adult age classes, at index sites.